Christ's Tomb Is Still Empty! His Tomb Is Still Empty! When I had my first opportunity to visit Israel many years ago, I was greatly enthused at the prospect of visiting the many historical sites of the Bible, and the places where Jesus lived and ministered. But among the many wonders to be explored, I was especially eager to see where many believe Jesus was crucified and buried, which was an awesome experience and the highlight of my trip. The day we journeyed toward the location, I was somber and thoughtful. In my mind, I recalled the visual images of Hollywood films I had seen which depicted Christs death  three crosses high atop a hill against the background of angry clouds and thunder. However, as I looked out the window, surely there had to be a mistake. I could hardly believe it. It was a bus station with acres of paved asphalt! It seemed impossible that the site of the most sacred event in history could be obscured and defiled by such a thing. Once I gained my composure, I looked beyond and saw the vague image a skull, a natural formation in the nearby rocky cliffs. It was obvious, this indeed had to be Golgotha  the place of the skull. Although the jagged skull in the rugged hillside should have been a strong clue for researchers, the site only gained its credibility as the genuine, historic Golgotha, a few decades ago. Before that, another site was considered the traditional location, although it lacked many authenticating characteristics. The location of the skull hill corresponded precisely with the description of the ancient writer. In addition, some years ago archeologists discovered that the bus station at the foot of the hill was built on top of what had been an ancient stone quarry. Diggings showed that this had probably been the Jews traditional place of execution, which was carried out by stoning. The Romans crucified Jesus (a Roman method of execution) at the place where Jews usually carried out their own method of capital punishment. The great evidence that brought convincing authenticity to the mentioned site was the discovery of the nearby garden tomb not more than 100 yards away, excavated from a hillside in 1867. 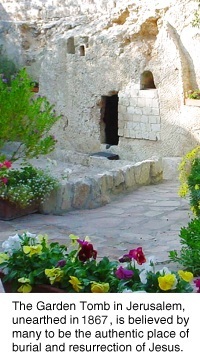 The Gospel of John described that Jesus tomb was in a garden near the crucifixion site (John 19:42) and belonged to a wealthy disciple, Joseph of Arimathaea. He and Nicodemus took Jesus body, prepared and placed Him in the tomb. According to scripture, the tomb of Jesus was the site of His resurrection  the greatest event in history and the single most important doctrine of the Christian church. Upon it hinges the entirety of the claims that Jesus made, including the eternal salvation of His followers (1 Cor. 15:13-14). As I first approached the tomb, it first appeared only as a jagged crevice in the side of a hill. But closer examination showed that it was a man-hewn cavern  a classic example of a first century tomb prepared for a prominent person. Before entering inside, I noticed the obvious indentation of a rut hewn in the rock beneath the opening. Archaeologists explain that this was a type of track used to guide the huge, wheel-shaped stone that sealed the entrance. Entering the tomb was an extraordinary experience. There inside the dual chambers, which probably measured about 8' x 15', I viewed a stone-carved pedestal on which a body would be laid. Then as I looked about the cavern in the dim light, I noticed that in one upper corner there was a carved symbol  it was the first letter of the Greek alphabet, Alpha, and in the opposite corner was Omega, the last alphabetic letter. The meaning could not be clearer. The Alpha and the Omega was a reference that Jesus made to Himself (Rev. 22:13), and it was apparent that the tomb was marked in ancient times to show that it was where Jesus once laid. For a considerable time I stood alone in the tomb, trembling and praying. It was an awe inspiring experience. I became profoundly aware that I was standing at the site of the greatest miracle ever known to mankind  the intersection of Gods love to the human race. This was where Jesus broken body laid and where His resurrection life burst forth! I felt humbled and unworthy to stand on the same stone floor where Jesus holy feet stood and walked. Finally, it was time to go. But as I stepped to the opening to exit, I paused and looked back momentarily, reflecting on the impact of this incredible pilgrimage. I grinned and thought to myself, Nobody was home here! Buddha, Mohammed, Confucius may be found in their tombs, but my Lords grave is still empty. Jesus, our risen Savior, is alive and well! This article (VL-608) is copyrighted © by Dr. Dale A. Robbins, 1990-2019 and is a publication of Victorious Publications, Grass Valley, CA - Nashville, TN. Unless otherwise stated, all scripture references were taken from The New King James Bible, © Thomas Nelson Inc., 1982. You may download this article for personal use as long as you retain credit to the author. Obtain permission before reproducing copies for any reason, by filling out our simple use permission form. Many of our writings are also available as free pdf tri-fold pamphlets, which can be downloaded for reproduction from our Online Catalog. For media reproduction rights, or to obtain quantities of this title in other formats, email us. If you have appreciated these online materials, help us reach the world with the Gospel by considering a monthly or one-time tax-deductable donation.